A contemporary garden or outdoor swimming pool can be a great way to cool off in the summer, and when the swimming pool covers are on, the fun can continue with steaming hot tubs or home spas. Better yet, if you have the budget and the space to work with, why not install an indoor swimming pool that can be enjoyed all year round? Whether you are looking at the luxury of hot tubs, want a small plunge pool, or you’re planning a brand new outdoor swimming pool or home spa installation, we have plenty of contemporary hot tub and outdoor pool designs for you to dip into here at Houzz. Do new indoor or outdoor swimming pools increase the value of homes? Outdoor or indoor swimming pools can significantly impact property value by attracting buyers with bigger budgets who are looking for a little luxury in their home. However, installing a large contemporary swimming pool could also negatively impact the value of your house if there isn’t enough space left in your garden for anything else. This is why it is important to seek guidance from a swimming pool installer or expert, and choose a swimming pool installation that can fit tastefully in your garden. If you are planning to sell your home, you may also want to look into the range of large inflatable, above ground swimming pools now available so that you can take it with you when you leave. What type of swimming pool should I install? The British weather can be unpredictable at best, so while an infinity pool or luxurious outdoor pool may be a stunning addition to a holiday villa abroad, it may be a good idea to look into small contemporary plunge pools, heated pools and indoor swimming pool designs instead. This doesn’t mean you will have to compromise on style – even natural swimming pools, which can look stunning when well placed in leafy and luscious gardens, are heatable and therefore usable in slightly colder months. If you don’t quite have the space for a large swimming pool, there are plenty of small contemporary swimming pool ideas and designs to work with, and if you speak to an expert they may be able to design bespoke swimming pools to fit perfectly in the space you have. Simple plunge pools are great additions to courtyard gardens or other quiet outdoor spots where you want a quick, refreshing dip, but don’t want the space to be dominated by a large pool. A plunge pool will have to be very carefully planned out, however, as you need the right drainage and safety features, so you can’t just throw one in wherever you have space. Speak to a professional who has experience installing plunge pools beforehand. Of course, with nice garden hot tubs you may not be able swim lengths but you will be able to relax in your garden no matter the weather as you look up at the stars. If you are on a budget there are also affordable inflatable hot tubs that could work in your garden. And, just like inflatable pools, the extra advantage is that they will be able to come with you if you move! What material should I use for spas or hot tubs? For a hot tub to survive the changing seasons it is important to choose a material that will be durable. Cedar or other wooden hot tubs can look attractive, but will be harder to maintain. The most popular material is often vinyl for its affordability and versatility but this material is also less likely to last. To get the best bang for your buck, we would recommend opting for a concrete or a fibreglass hot tub or spa, which would provide you with a sturdy solution. In addition, metal above ground hot tubs can be a durable option. To finish off the design of your hot tub we would also recommend that you build a wooden platform around it or take a look at our canopies and gazebos for some privacy. Browse the contemporary swimming pools, plunge pools and hot tub photos from professional designers and installers and save your favourites to an ideabook. You can then contact the professionals that worked on any of these swimming pool designs to see if they can create something similar for your house project. Photo of a large contemporary indoor rectangular lengths swimming pool in Surrey with tiled flooring. Design ideas for a medium sized contemporary indoor rectangular above ground swimming pool in London with natural stone paving. 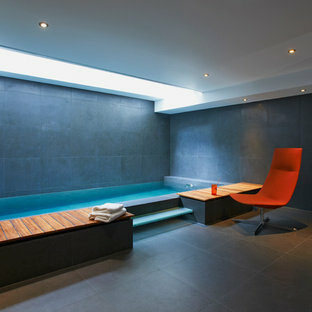 Contemporary indoor rectangular swimming pool in London. This is an example of a contemporary swimming pool in London. Design ideas for a medium sized contemporary indoor rectangular lengths swimming pool in Surrey with natural stone paving. Inspiration for a contemporary indoor rectangular lengths swimming pool in London with a water feature and tiled flooring. Design ideas for a contemporary rectangular swimming pool in London. Inspiration for a contemporary swimming pool in London. 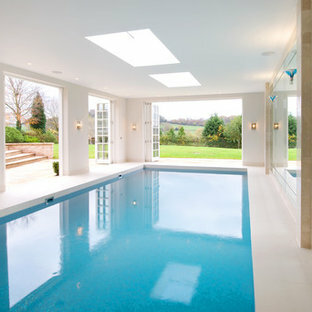 Photo of a contemporary indoor rectangular swimming pool in Cheshire. 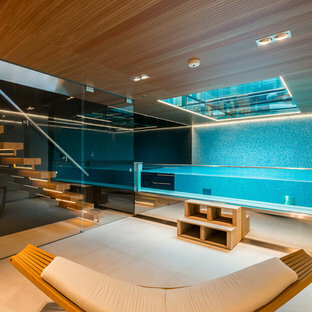 Contemporary indoor swimming pool in London. 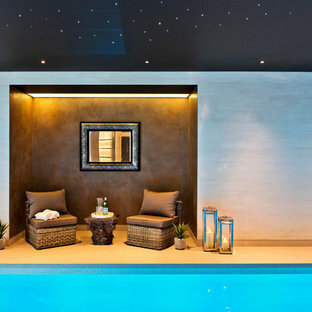 This is the lower-ground floor pool and spa room with lap pool and private hammam, created by Cubic Studios. 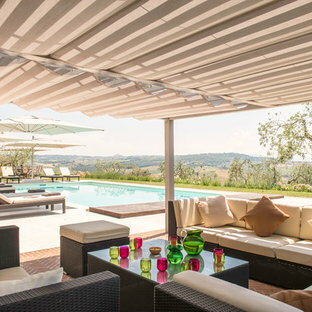 Roche Bobois and Duffy London styled and furnished the property exclusively for Domus Nova. Photographed by Trevor Richards. Contemporary pool house amongst a traditional setting. Our existing clients asked if we could look at renovating their existing pool area. Within six months we had refurbished the pool, relayed the patio, designed and built a new pool house and even added an outdoor shower. ​Come grey skies or blue, this space is now able to be enjoyed all year around! Photo of a contemporary indoor rectangular lengths swimming pool in Other with tiled flooring. This was a fabulous project that had we had the privilege to be a part of. Working closely with the architect and interior designer gave great results all round. Design ideas for a contemporary roof swimming pool in London. Design ideas for a contemporary rectangular lengths swimming pool in London with decking and a water feature. 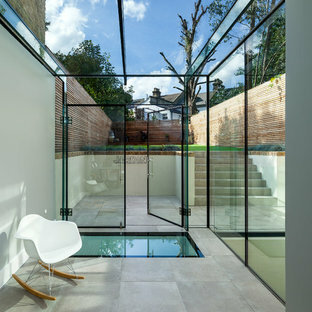 Photo of a contemporary indoor rectangular lengths swimming pool in London with a pool house. Contemporary swimming pool in Gloucestershire.